The Use of the Name. "Moses besought God to impart to him the knowledge of His name and its pronunciation so that he might be able to invoke Him by name at the sacred acts, whereupon God communicated His name, hitherto unknown to any man; and it would be a sin for me to mention it." Pronunciation of the Name by the Temple priests also gradually fell into disuse. Tosef., Soṭah, xiii. 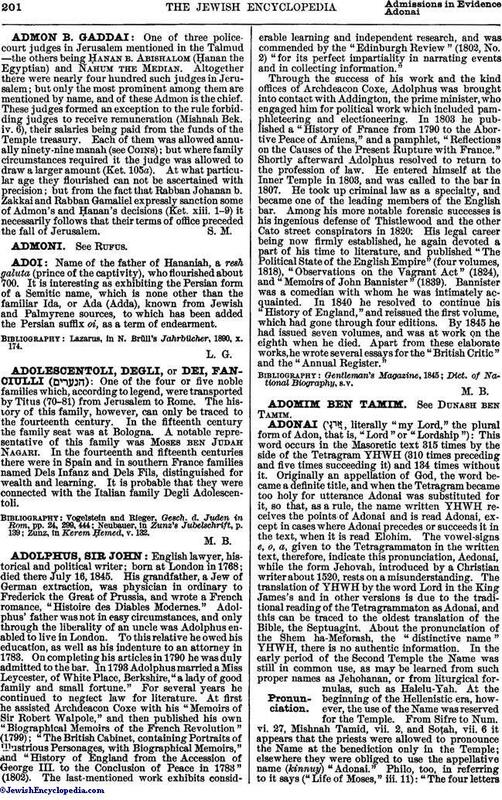 8, quoted Menaḥot, 109b, and Yoma, 39b, relates that "from the time Simon the Just died [this is the traditional expression for the beginning of the Hellenistic period], the priests refrained from blessing the people with the Name"—in other words, they pronounced it indistinctly, or they mouthed or mumbled it. Thus says Tosef., Ber. vi. 23: Formerly they used to greet each other with the Ineffable Name; when the time of the decline of the study of the Law came, the elders mumbled the Name. Subsequently also the solemn utterance of the Name by the high priest on the Day of Atonement, that ought to have been heard by the priests and the people, according to the Mishnah Yoma, vi. 2, became inaudible or indistinct. 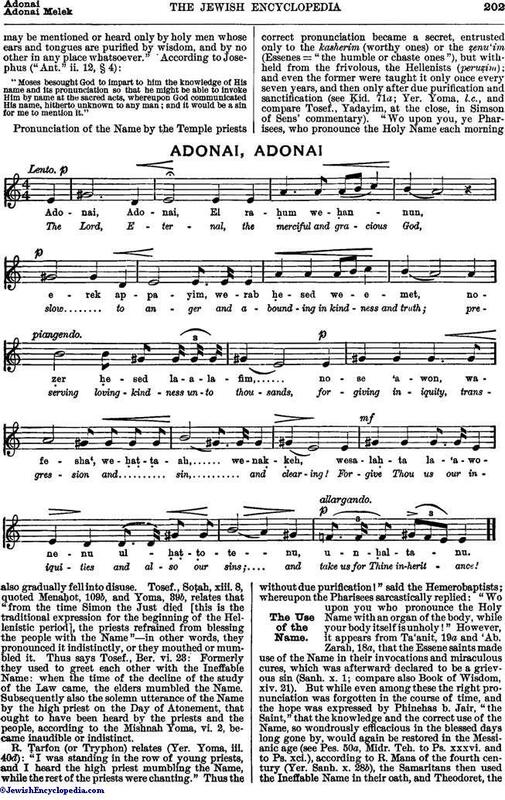 ADONAI, ADONAI The Use of the Name. R. Ṭarfon (or Tryphon) relates (Yer. Yoma, iii. 40d): "I was standing in the row of young priests, and I heard the high priest mumbling the Name, while the rest of the priests were chanting." Thus the correct pronunciation became a secret, entrusted only to the kasherim (worthy ones) or the ẓenu'im (Essenes = "the humble or chaste ones"), but withheld from the frivolous, the Hellenists (peruẓim); and even the former were taught it only once every seven years, and then only after due purification and sanctification (see Ḳid. 71a; Yer. Yoma, l.c., and compare Tosef., Yadayim, at the close, in Simson of Sens' commentary). 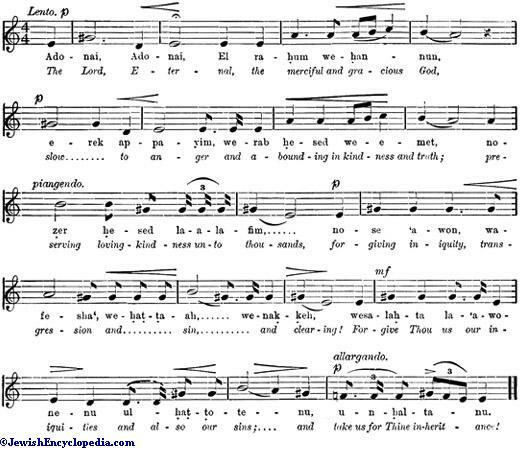 "Wo upon you, ye Pharisees, who pronounce the Holy Name each morning without due purification!" said the Hemerobaptists; whereupon the Pharisees sarcastically replied: "Wo upon you who pronounce the Holy Name with an organ of the body, while your body itself is unholy!" However, it appears from Ta'anit, 19a and 'Ab. Zarah, 18a, that the Essene saints made use of the Name in their invocations and miraculous cures, which was afterward declared to be a grievous sin (Sanh. x. 1; compare also Book of Wisdom, xiv. 21). But while even among these the right pronunciation was forgotten in the course of time, and the hope was expressed by Phinehas b. Jair, "the Saint," that the knowledge and the correct use of the Name, so wondrously efficacious in the blessed days long gone by, would again be restored in the Messianic age (see Pes. 50a, Midr. Teh. to Ps. xxxvi. and to Ps. xci. ), according to R. Mana of the fourth century (Yer. Sanh. x. 28b), the Samaritans then used the Ineffable Name in their oath, and Theodoret, theChurch father, in the fifth century, tells us that he heard it pronounced by them as Yabe, which is the equivalent of Yahweh. Even in the writing of the Name scrupulous care had to be taken by the scribes (see Soferim, v. 6). The day on which the Pharisees succeeded in abrogating the ancient Sadducean custom of having the Sacred Name written in public documents was celebrated as a great day of thanksgiving (explained correctly by Dalman, against R. H. 18b; compare with Yadayim, iv. 8, "Wo upon you, ye Sadducees, who write the name of the temporary ruler alongside of the Sacred Name!"). No wonder, then, that the Greek translators of the Bible, even though some scribe might now and then write the Tetragrammaton in the archaic Hebrew form on the margin, Π I Π I, as found by Origen (see facsimile attached to article Aquila), took great care to render the name Π I Π I regularly Κυριός, Lord, as if they knew of no other reading but Adonai. Translations dependent upon the Septuagint have the same reading of the Name. Not from "superstitious fear" or misapplication of the third command of the Decalogue or of Lev. xxiv. 11, but from a reverential feeling that the Name ought not to be pronounced except with consecrated lips and to consecrated ears, the substitute "Lord" came into use. Yet this simple measure, introduced to guard the Name against profane use, formed one of the most powerful means of securing to the Biblical God the universal character with which He is invested as the Lord of Hosts and the Ruler of men and nations. YHWH, as the God of Israel, might still be taken as a tribal God; The Lord is no longer the God of one people; He is Lord of all the world, the Only One. 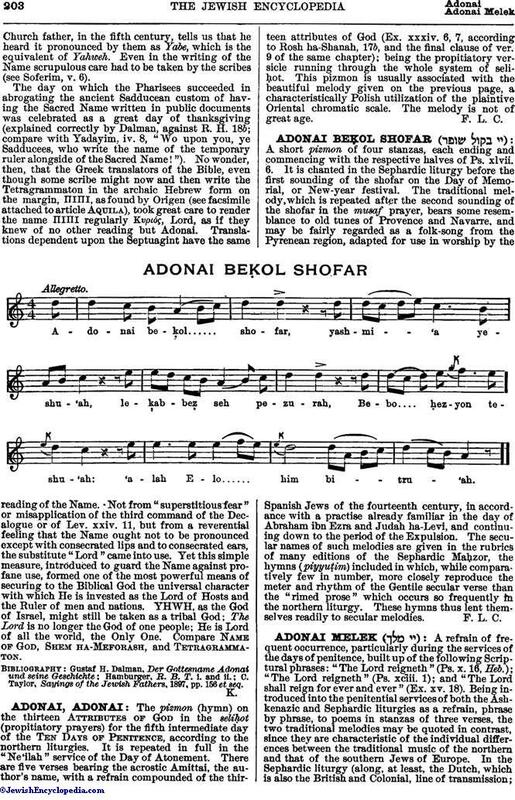 Compare Name of God, Shem ha-Meforash, and Tetragrammaton. C. Taylor, Sayings of the Jewish Fathers, 1897, pp. 156 et seq.